Congratulations, Dee! Thank you for allowing Curtain-Tracks to assist with your sail boat curtains project. And, thank you for sending us pictures of the finished product. We love how they look in your boat! You were the winner of our recent contest, so to show our appreciation, we are sending you a chicken dinner. Just kidding! A $50 Amazon gift card is on its way! Enjoy! Brenda asked Dee lots of great questions about what she was envisioning for her boat curtains. Brenda took those ideas and made her vision a reality and she was tickled by the results. 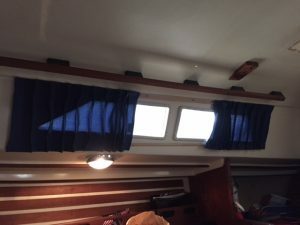 Dee liked her new boat curtains so much she even shared our information with her brother and sister in law who now plan to have Brenda help with their sailboat. Referrals are the ultimate compliment for Curtain-Tracks and we are certainly appreciative that Dee liked us enough to share us with her brother. Want to become an internet sensation like Dee? Send us your photos and we will give you some love on our website. We love seeing completed projects and so do our readers. We often run contests so keep an eye on our blog for your next chance to win.